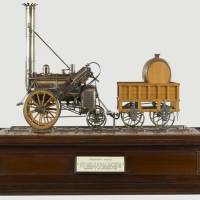 Tender model of the original designed and built by Stephenson for the Rainhill speed trials on the Liverpool to Manchester Railway, 1829. By Dr John Bradbury-Winter, 1932. Model complete with firebox, boiler, chimney, driving wheels, hub and tyres, wooden water barrel, cylinder, spokes and felloes. The hubs of the wheels are engraved 'R Stephenson & Co, Newcastle Tyne' as on the original engine. Scale: 3/4 inch to 1 foot.